THE Premier, Cabinet Ministers, police and the Crime and Corruption Commission all received advanced warning of the conduct of a central Queensland building group that has left a debt trail of more than $50m before heading into liquidation. Despite the $31 million implosion of J.M. Kelly Project Builders in 2016, the Government continued to deal with the J.M. Kelly Group through another of its companies, J.M. Kelly Builders. Government departments simply transferred 21 contracts from one entity to another, both of which had the same Rockhampton address. J.M. Kelly Builders in turn went into administration in October last year and finally liquidation in November with debts of more than $20m. Its general manager, John Murphy, had also been general manager of Project Builders and had been the subject of numerous complaints he had signed false statutory declarations that subcontractors and suppliers had been paid. No charges have been laid over the collapse. The entire group is now in liquidation with J.M. Kelly Builders alone leaving 397 unsecured creditors owed in excess of $11 million. One company, sand and gravel extraction business Pink Lily Sands, is still being traded by the liquidator. Subcontractors want the Queensland Government to make good their losses that run into millions of dollars on state infrastructure projects. Subcontractors Alliance spokesman Les Williams said the State Government was the client and regulator responsibly for licencing J.M. Kelly, as well as the authoriser of its Pre-Qualified Contractor status that gave it access to lucrative contracts. One electrical contractor was so concerned in 2016 that he drove to Annastacia Palaszczuk's electoral office and refused to leave until staff had sent a copy of a previously unacknowledged email to her parliamentary chambers and secured notification of its receipt. Craig Barlow of CJ Electrical had earlier sent emails to the Premier, the Minister of Housing and Public Works, the Police Minister - who at the time was former Rockhampton MP Bill Byrne - and the then shadow housing spokesman Stephen Bennett, detailing issues with non-payment or late payment of subcontracts by Project Builders on Queensland Government projects. Mr Barlow said he would not stand by and see contractors and subbies not being paid while working on government contracts. "People and businesses engage in Queensland Government contracts in the belief of guarantee of payment," he wrote. "If you complete a contract in a safe and timely manner showing quality of work, they get paid. Well, it is still not happening." Mr Barlow alleged the J.M. Kelly Group had signed statutory declarations guaranteeing payments had been made to subcontractors when that was not correct. Statutory declarations were required by clients in Queensland before progress payments were released. The list of companies reported to have failed in our Back Our Subbies series contained an error. Custom Homes Queensland, a Cairns-based business, was named as a failed company when it should not have been. Queensland Custom Homes, an Ormeau-based company, was wound up in the Supreme Court last month. We apologise for the mistake. In his email Mr Barlow said allegations about the practice had first been made to the government in 2013 and claimed that it occurred more often in the 12 months to the point of J.M. Kelly Project Builders liquidation in June, 2016. Wayne Harris, the central Queensland manager of John Goss Projects also wrote to the Premier on August 3, 2016, in support of Mr Barlow's plea for help. 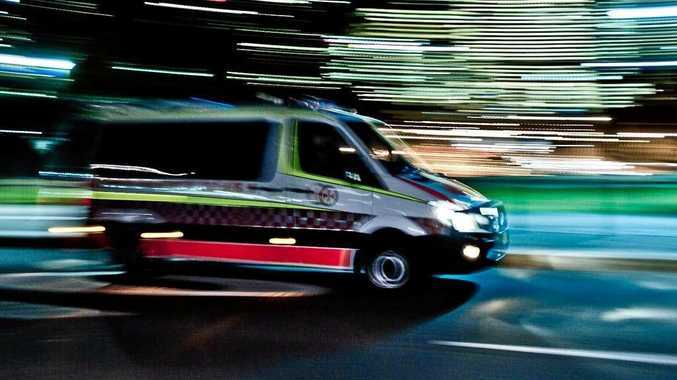 "Our company John Goss Projects Pty Ltd is one of hundreds of Queensland companies affected by the J.M.K Kelly Group of companies' actions," he wrote. He confirmed that subbies and suppliers were not being paid - or, if they were, not until months later. "It's common knowledge and when someone complains nothing gets done about. Why is that?" John Goss Projects was left unpaid more than $200,000 on a Biloela State School electrical and air-conditioning project. Complaints in writing to the government contract supervisor led to warnings to J.M. Kelly Project Builders manager John Murphy about the signing of false statutory declarations but the practice allegedly continued. "I could give you a copy of the creditor's list from the liquidators of J.M. Kelly Project Builders and 80 per cent of that list is government-related works that the monies are owed," Mr Harris wrote in correspondence with Ms Palaszczuk. "That's millions of dollars from the Queensland Government paid to a rogue company that should have been passed onto people like ourselves but didn't. "What's stopping the same company doing this again and again. I can answer that nothing unless the Queensland Government actually does something to right this wrong. J.M. Kelly should be wiped from all government projects." Just over two years later in its second report to creditors of J.M. Kelly Builders last month, liquidator PwC Australia indicated a number of creditors had been identified as not being paid. PwC was to find more than 70 instances where the company records did not support its own assertions in statutory declarations that contractors and suppliers had been paid. 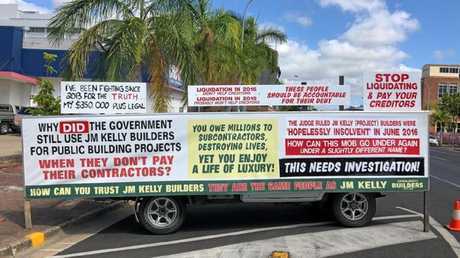 Unpaid JM Kelly Group creditor Mick Barfield drove from Mackay to Rockhampton to protest outside the second creditors meeting of JM Kelly Builders. However a report to Queensland Police led only to the matters being referred on to the Australian Investments and Securities Commission. On July 14, 2016, Patrick Kirwan Pty Ltd wrote to Mr de Brenni identifying outstanding invoices totalling $168,598.55 dating back to February 5, 2013, relating to state and federal government projects undertaken by J.M. Kelly Project Builders. "J.M. Kelly Project Builders' payments were usually paid way overdue usually from 90-140 days overdue," the company informed the Minister. "This had been a regular practice during all of the 25 years we had worked for J.M. Kelly Project Builders. Cheques promised were usually kept in their office until staff were sent to pick them up, after much phoning etc." That's a complaint Patrick Kirwan Pty Ltd shared with the Bundaberg-based Ali, Glass and Stainless director David Willoughby. Former J.M. Kelly Project Builders general manager and more lately J.M. Kelly Builders director John Murphy allegedly continued to promise he would pay money owed by J.M. 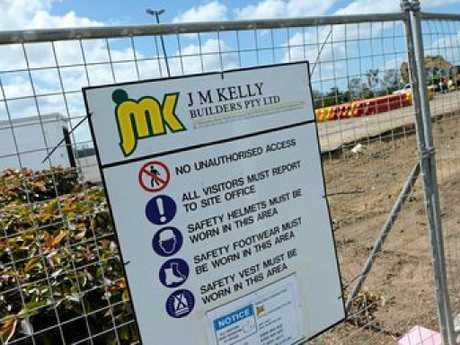 Kelly Project Builders more than a year after it went into liquidation and ceased to exist. The money, owed from November 2015, was never paid but the intent to do so was clearly expressed in numerous emails sent to Ali, Glass and Stainless director David Willoughby. Between his present business and his former role managing another company, Mr Willoughby said he had dealt with J.M. Kelly Builders and J.M.K Project Builders for the past 15 years. Under terms of the contracts he signed payment was meant to be due within 30 days. "They always paid but were late payers," he said. "They were the first to make 45 days the new 30 days and then 60 days the new 45. "You could chase the money as hard as you liked. "They were the last of the builders still to pay by cheque and they were dated as when they should have been received but they then held them. "To get paid you had to front the office and demand 'where's my money'." Mr Willoughby has written to Housing and Public Works Minister Mick de Brenni, the State MPs for Bundaberg and Mulgrave and the LNP's Housing and Public Works spokesman Michael Hart, calling for non-paying principal contractors to be stamped out of the construction industry.